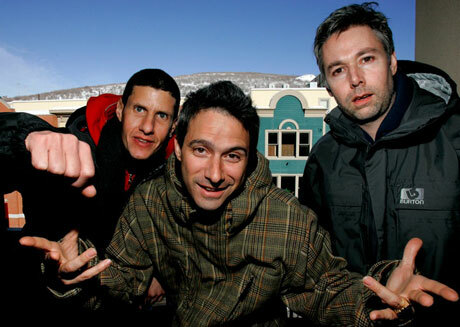 Kudos and acclaim for Brooklyn hip-hop icons the Beastie Boys reached a high yesterday (December 7) when it was announced the trio would be inducted into the Rock and Roll Hall of Fame next April, but classic funksters War have let it be known that they aren't happy about the nod. While it might come off as a case of sour grapes, considering War were among the nominees that didn't make the grade, the band's beef with the Beasties is more than just petty jealousy. Speaking with TMZ, vocalist and founding member Howard Scott expressed that he was "shocked" to learn the Beastie Boys made it in over his act, because War's music was the backdrop for some of their earliest jams. Pointing to the rap act's sampling of War's well-known 1975 number "Low Rider" for their "Slow Ride," off 1986's Licensed to Ill, Scott said "How could the Beastie Boys get in before us when they sampled War's music on their first album?! I'll eat their platinum records!" The singer also tossed in a few low blows by going the ageist route: "We were cranking out gold records when they were still in diapers." The Beasties have yet to respond to the diss, but we have a feeling they'll take the high road and just ignore it. The induction ceremony for the Rock and Roll Hall of Fame takes place in Cleveland, OH on April 14.